Left to right: Francis Jue, Linden Tailor, James Seol. Photo courtesy Kevin Berne and Theatreworks. Very few activities reflect the human spirit and its desire for transcendence like the precision and craft of cuisine. In particular, the culture built around sushi and its construction, as revealed to broader America in the documentary Jiro Dreams of Sushi, is slow, grueling, and demanding of perfection. 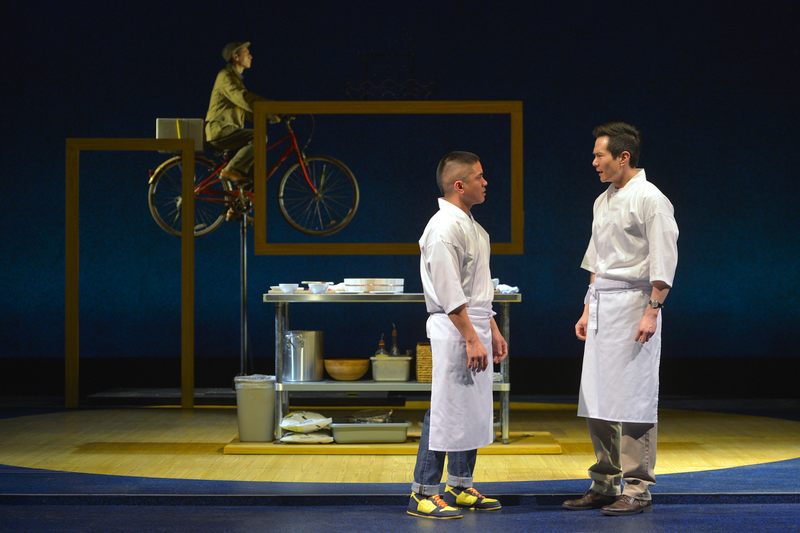 Kimber Lee’s tokyo fish story, directed at Theatreworks by Kirsten Brandt, uses both character interactions and broader structure to contrast the art of sushi with the demands of the real world. 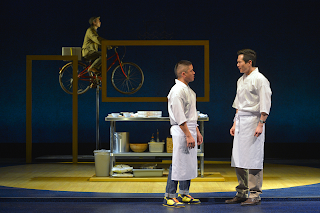 In a way, tokyo fish story is two plays at once: The poetic saga of sushi master Koji (Francis Jue), as his restaurant weathers a changing Japan, and the realist drama of his son Takashi (James Seol), who quashes his own culinary innovations out of fealty to his father. The merger of the two serves not only as a multifaceted look at a complex family relationship, but gives Koji the vulnerability he needs to become more than just a strict father. Seol’s Takashi is the standout performance in the Theatreworks production. Though second apprentice Nobu (Linden Tailor) makes fun of him for being almost as uptight as Koji, in reality Takashi masks the pain of not knowing whether his father will ever see him as an equal. Takashi is a different person to every character in the play, and Seol portrays him with the beautiful emotional delicacy required for the audience to understand this. Nobu’s role is meant to push Takashi into action and to provide a dose of levity. A lot of plays have similar “jester” characters, many of whom are loud and into pop culture (Star Wars in this case). Nobu serves this role while genuinely caring about his job and his mentor. While Tailor never tones down his intensity, he still finds ways to show his dedication to his work. Wilson Chin’s set flips the conventions of the proscenium theatre on its head to meet the varying needs of the production. Normally, the stage is used to create a two-dimensional effect like a television screen, but here, the multi-tiered wooden framing and use of suspended sculpture create a theatre space that can be unified or split into narrow zones as the direction demands. This creates room for the actors to maneuver, but still feels cramped and uncomfortable like a tiny kitchen. tokyo fish story at Theatreworks is a look into a life profoundly different from our own, where a three-decade apprenticeship is not unexpected, and one can not notice a neighbor has been gone for two years. It’s a play that observes multiple lives traveling at different speeds, and how someone “irrelevant” can still be incredibly important. Rather than critiquing the pace of the current generation, Lee is simply sitting at the counter and asking us questions about how things will change.